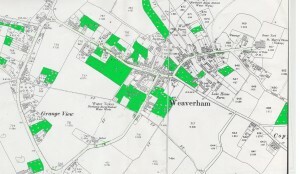 Weaverham once had many orchards, now they have almost all gone. “Bebbington’s, Popular Cottage – his pear and apple orchard stretched from his yard up to the bowling green , which ran alongside the school playgrounds. Moreton’s Northwich Road – mixed orchard of pears, apples and plums. The orchard stretched from where the chip shop now stands, along Northwich Road, down Church St up to the toilets, then back up to the farm. Well fenced, in a three foot block wall all the way round, a hawthorn hedge on the top and a large lime tree on the corner of Church St.
Percival’s, High St – apple orchard, opposite the school stretched away back almost to the water tower, situated at the top of “Brickley”. 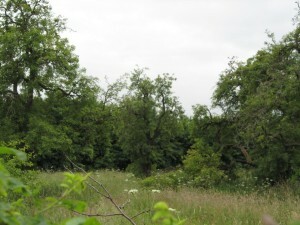 Dr Shaw’s, Smith’s Lane – a long pear orchard almost reaching down to well lane. The Ring O’ Bells’ pear orchard – I don’t know who owned this orchard situated opposite the large gates on the side of the Ring O’ Bells pub. Earlier in the 19th Century there were fewer orchards. 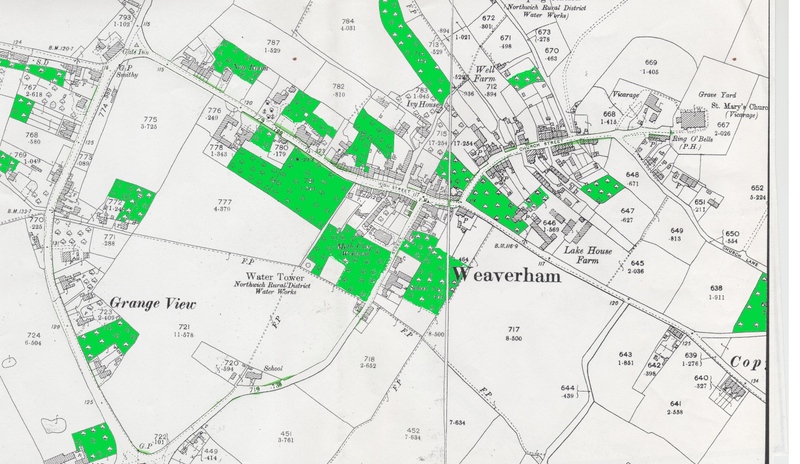 The 1840 Tithe apportionments only mentions 9 orchards in the parish, some of these were outside the village itself. It is likely that fruit growing increased dramatically with the coming of the London and North Western Railway from 1840 onward. As railways proliferated this gave rural communities access to the growing urban markets of Liverpool and Manchester and even further away. Today the only surviving orchards are at Beach Farm and at the former site of Nook Farm, near the roundabout on the A49 at the south end of West Road. The Nook Farm orchard is in a sad state, with just a few very old trees remaining, nearing the end of their life. ( Apple trees usually only have a life span of 50 to 80 years ). Elsewhere a few solitary trees may remain in peoples back gardens, remnants of former orchards. If you live in Weaverham, Gorstage or Bryn and have an old apple tree in your garden we would like to know – it might be a Weaverham Russet. We can arrange to send an apple to the National Fruit Collection at Brogdale for identification.